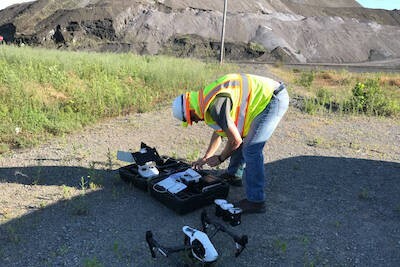 TruePoint has FAA licensed pilots to aid in aerial video, building surveys, property surveys, and photogrammetry services. TruePoint utilizes DJI brand drones equipped with HD video and HD photo cameras. We offer safe, accurate and cost-effective data collection, ensuring positional accuracy in vast, dangerous or hard to reach areas. We have extensive experience with and knowledge of drones. We work closely with our clients to harness the power of these unmanned aircraft systems for their specific needs and applications. TruePoint provides commercial drone services nationwide. We have worked in many different industries completing successful projects throughout the United States. With the rapid rise of the drone industry, the amount of businesses entering the marketplace and offering aerial drone services has increased exponentially. Much more goes into operating a professional, high-quality, safety-conscious drone than simply purchasing and flying one. We take great pride in offering aerial drone services for our clients. TruePoint is a highly experienced team of 3D laser scanning professionals who deliver exceptional service with a fast response, technical expertise and long-term client commitment. You can trust our team to provide the best experience in laser scanning by walking you through the entire process from pre-planning to final deliverables. TruePoint’s team has expertise from many “real world” disciplines, including engineering, architecture, information technology, and construction. Having this combination of knowledge is integral to providing you with the best laser scanning service and deliverables that save your team time and money on your next project. TruePoint is an Ohio-licensed engineering firm with structural, civil and chemical engineers. We offer nationwide service and have worked in many different industries. Our consultative approach ensures you get the right information so you can use it to make informed decisions now and for future projects. Our team of in-house engineers, architects and CAD technicians all have "real world" experience in their respective disciplines and work with point clouds and photogrammetry every day to create deliverables that are practical and useful. We can build models to any level of detail. We perform hundreds of successful projects every year. 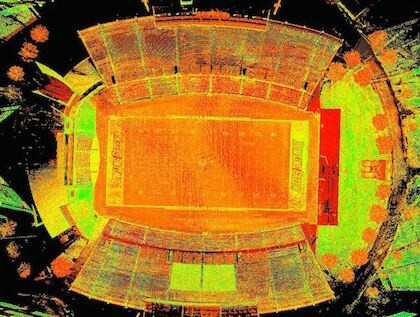 3D laser scanning, modeling and aerial photogrammetry is our sole business, not just one aspect of it; we are dedicated to providing our clients timely and accurate responses and results. To learn more about TruePoint drone services, contact us today at 419-843-7226 or info@truepointscanning.com. TruePoint offers aerial drone video and photogrammetry services with our DJI Inspire 1 Pro Quadcopter. Orthoimage of entire site overlaid on Google Earth. Photos taken from drone capturing the client's entire site in several hours. Dimensionally-accurate photos blended together into one image used for inventory verification.